The cPanel backup system provides lots of flexibility, and one of its awesome features is the ability to create custom backup transports. In cPanel, a backup transport or destination is a method to move backups to a secondary/remote server for safe keeping. The custom backup transport feature allows you to specify a script which the backup system will pass arguments to; arguments common with uploading files in FTP, e.g. ‘put $filename’. Reading over the documentation, it may at first appear a daunting task; however, today we’ll walk you through the process by creating a backup destination utilizing Dropbox and their very thoroughly documented API. 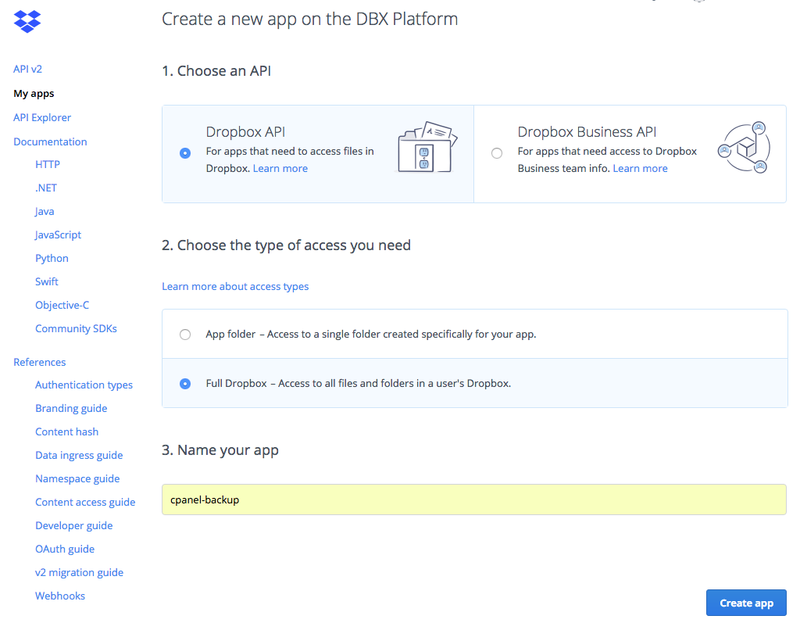 After creating the Dropbox app, you’ll be redirected to the Settings page for your app, which will provide your API credentials. Keep track of the App Key, and App Secret. Then click the Generate access token button and retain that as well. Now that we have everything we need from Dropbox to configure the custom transport, let’s prepare the server environment. To make things simple, we’ll utilize CPAN WebService::Dropbox. On CentOS 7.4, this installed without complication. However, on CentOS 6, I also needed to install the perl-YAML package. 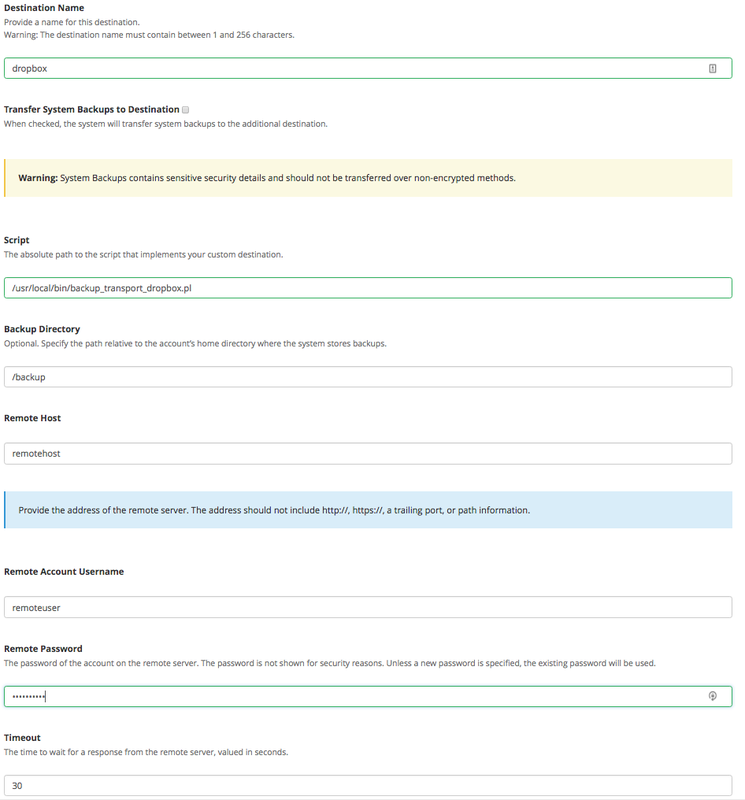 Now that we have the CPAN module installed, take the time to briefly read over the custom transport documentation to familiarize yourself with the system. 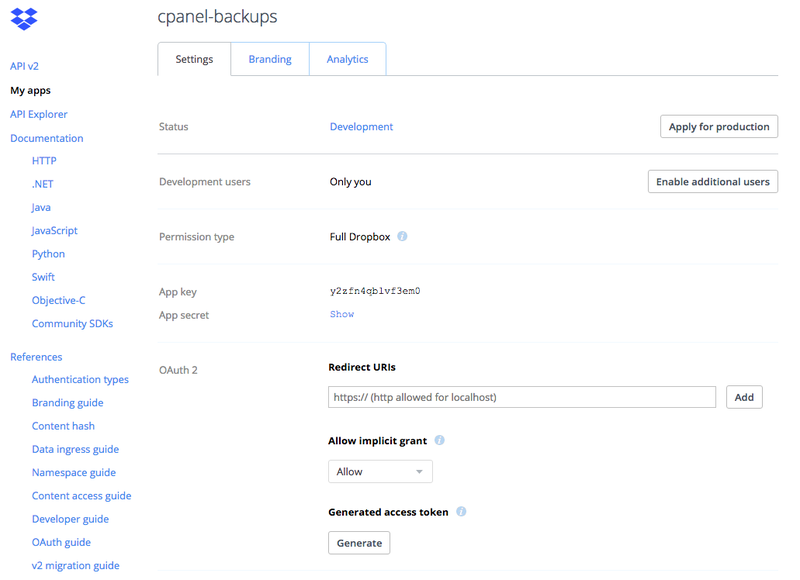 Once done, read over the template files we ship with cPanel, located at `/usr/local/cpanel/scripts/custom_backup_destination.pl.sample‘ and `/usr/local/cpanel/scripts/custom_backup_destination.pl.skeleton‘. Keep in mind that since we ship both the sample and skeleton files, direct edits to these files will be overwritten during nightly updates! Be sure you do not use the same file path as these templates. During the CPAN installation for WebService::Dropbox, you may be prompted to answer “Do you want to install it permanently?” Since these are relatively small modules and having them installed will help with future CPAN module installations, so I chose “yes” for each prompt. With your favorite text editor, take the Dropbox credentials you saved earlier and update the MY_APP_KEY, MY_APP_SECRET, and MY_ACCESS_TOKEN placeholders. Be sure to hit Save and Validate Destination at the bottom of the screen. Congratulations, you’ve just created your first custom backup transport script, how cool is that?! Feel free to fork us on GitHub and be sure to share with us your custom backup transport scripts! A quick note: Content just like this will be the norm at this year’s cPanel Conference. If you haven’t already, join us in our semi-official cPanel Discord or Slack, or come to visit Houston, Texas for the 2018 cPanel Conference, October 1st – 3rd.